Click here to download as a .PDF file. 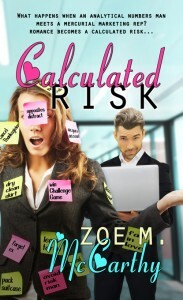 What inspired you to write Calculated Risk? I’m a retired actuary. (Actuaries evaluate the financial risk of insurance companies.) I believed I could use my twenty-five years in the actuarial field in a story. And, I knew I could write the romance of extreme opposites because I’m both Cisney and Nick—and a romantic. All the personality tests say I’m a creative expressive and an analytical borderline introvert. Plus, my husband is a retired analytical actuary. A perfect model for Nick. As an actuary, I worked often with marketing reps like Cisney. So I had everything I needed to write a story about extreme opposites falling in love. How does being both a creative expressive and an analytical introvert contribute to your writing? As an expressive I’ve always wanted to write long novels. I’ve disliked short stories. But during the beginning of my faith walk, I had to write short stories to explain to myself what I read in the Bible and heard in Bible studies. My analytical side found it easy to write concise stories that got to the point and spelled out the teachings. However, my expressive side demanded I use my creativity to come up with bizarre plots and interesting characters. My analytical side went through all the steps to self-publish two books of the Christian contemporary short stories. My expressive side enjoyed giving dramatic readings of the stories in such venues as pulpits, women’s groups, and a prison ministry. What is the theme of Calculated Risk? Mere humans, even those with good intentions, cannot play the roles of God’s co-leaders in orchestrating others’ lives. Calculated Risk shows how a woman struggling under the influence of her overbearing father can respectfully free herself by redirecting her focus to God and His promises. “See to it that no one takes you captive through hollow and deceptive philosophy, which depends on human tradition and the elemental spiritual forces of this world rather than on Christ” (Colossians 2:8 NIV). What is a lesson you learned from writing Calculated Risk? I learned much about communication. Cisney’s open and expressive nature doesn’t make her a good communicator. She communicates well when she’s leading her work team, translating Nick’s mathematical points into their lingo. Too often, though, she’s expressing in her own mind and second-guessing what others think and will do. She doesn’t communicate well with her overbearing father or her reserved mother. Nick’s private and analytical nature doesn’t make him a good communicator, either. At work he’s known as the translator of his brainy boss. Yet, in the name of privacy, he seldom thinks about what others might need to know from him. And he’s not going to say something until he’s sure he’s right. How did you use your own experiences in writing the book? In the past, actuaries had the reputation of being weird. I worked with and loved several whose actions would put them in to this category. The richness of their unique personalities inspired my characters in the actuarial department. Of course, I had to change what they did so as not to write about a real person. Also, I made Cisney play Flight of the Bumblebee on the Steinway concert grand piano belonging to Nick’s family. When I was thirteen, I attempted playing the flute, but I could barely produce a sound. I ended up in a tiny soundproof room at a music store taking lessons from a short, round German. He’d play Flight of the Bumblebee, his fingers flying over the keys, to show me what I could do. And when that day came, he promised me a kiss. No worries there. But when I pulled my skirt down, he pushed it back up, saying he “wanted me to be comfortable with him.” My mother sat with me knitting after that! What did you find was the biggest challenge in writing Calculated Risk? In prior manuscripts, I avoided including family members in my stories. It seemed too much emotional work. But I loved meeting and watching Nick’s family members display their personalities, actions, and dialog. They had me laughing often. The challenge was writing Cisney’s family. I had to let them be themselves, and that was difficult. But now I love making family members a significant part of my stories. Letting them be themselves taught me they could add so much to the stories and the humor. What is your favorite quote and why? “To love is not to look at one another: it is to look, together, in the same direction.” —Antoine de Saint-Exupéry (Wind, Sand and Stars, 1939) The Bible tells us that when we marry, we become one. What I like about this quote is that we can be extreme opposites but still be one and look together in the same direction. My husband and I are opposites, especially when I’m in creative, expressive mode. Yet, we look in the same direction on the important issue, such as our faith and family.